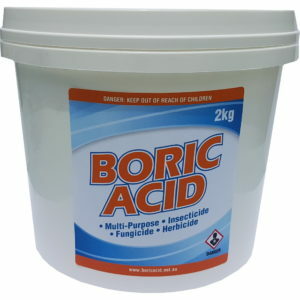 Boric acid is a low-toxicity mineral with insecticidal, fungicidal, and herbicidal properties. Boric acid, also called orthoboric acid, boracic acid, hydrogen borate and acidum boricum, is a low-toxicity mineral with insecticidal, fungicidal, and herbicidal properties. It is the “secret ingredient” in many of the commercial products used for insect control. It is also a weak acid of boron, often used as a flame retardant, antiseptic, or precursor to other chemical compounds. Its chemical formula is H3BO3, and exists in the form of a white powder or colourless crystals that dissolves in warm water. It does not evaporate or volatilise into the air. Boron, the main element of boric acid, doesn’t exist in nature by itself. It must be combined with other elements to create compounds. Boron is an essential micro nutrient for plants and humans. We get 1-3 milligrams of boron every day from the food we eat. Grains, nuts, fruits and vegetables are good sources of boron. 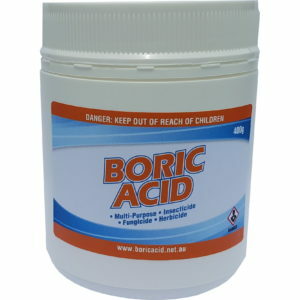 Boric acid is known as a desiccant which means it induces or sustains a state of dryness in its local vicinity. It acts as a insect killer by removing moisture from the body causing severe dehydration and eventually death. It maintains its potency for a long period of time and is highly effective in extremely small amounts. While it is not as fast acting as synthetic pesticides, it does not pose the considerable health concerns as the synthetic pesticides and remains highly effective over a long period of time. It is odourless and, unlike other insecticides, is non-repellent. That means that insects will continue to return to the treated areas. Boric acid is not Borax, but there is a relationship between the two. Borax, also called sodium borate (Na2B4O7.10H2O), is a colourless, salt-like white powder. 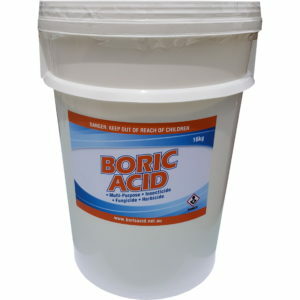 Boric acid can be derived from Borax when mixed with Hydrogen Chloride (HCL) and Borax can be produced as a by-product of boric acid being mixed with other minerals. 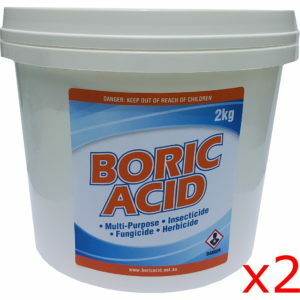 Boric acid is excellent for killing insects. It works as a desiccant to dehydrate the insects, eventually causing death. It also attaches to the insects’ feet as they walk through it allowing it to be taken back to the nest. It is neither an attractant nor a repellent so the insects will keep coming back to treated areas. Within 2-3 weeks you should start to see some results and it can take up to a month to spread through an entire colony. Virtually anything can be harmful to humans if not used correctly. Even water! If you drink too much water you can die from water intoxication. The toxicity of a substance is measured by the Median Lethal Dose 50 (LD50) system. The higher the number, the lower the toxicity. Boric acid has a high LD50 number on the scale and it’s also very close to table salt. The main question we receive is how can I avoid getting sick from boric acid? The best way to do that is to not consume it and don’t use it in food. When handling it, always wear gloves and if you’re dusting it over surfaces be sure to not inhale the powder. You can wear a dust mask if you feel this is necessary. 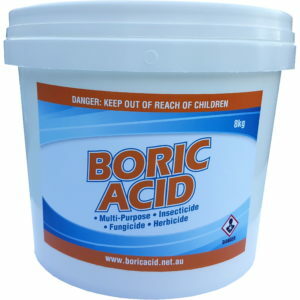 Always keep Boric Acid out of reach of children. 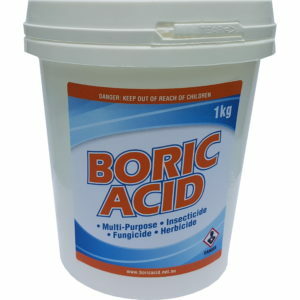 Boric acid is best kept in a tightly sealed container. At normal room temperature, it will last for years.